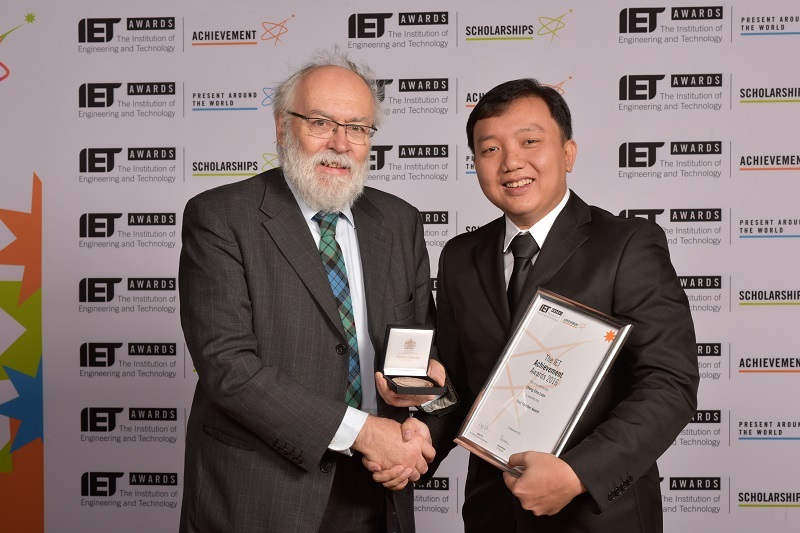 UTAR alumnus Cheng Chia Loon was awarded the Paul Fletcher Award 2016 at the IET Achievement Awards Ceremony 2016 held at London, United Kingdom on 16 November 2016. The award is given in memory of Paul Thomas Fletcher, who wished to encourage the participation of younger people in engineering institutions and to reward their success in doing so. It annually recognises a volunteer of The Institution of Engineering and Technology (IET) for outstanding achievement in contributing to the activities of the IET. The prize consists of an engraved medal, a certificate and £250 cash. The award came as a surprise to Cheng. “I was nominated by my peers from IET Singapore Local Network. I would like to thank my peers, family and the love of my life because I could not have achieved this without their endless support and encouragement,” said the Mechatronics Engineering graduate. “Engineering is a tough and challenging career, you need to have the passion and love of your work in order to succeed. I advise future graduates to choose the job you love, so that you will be able to appreciate and enjoy the forthcoming challenges in the process,” he said. Cheng is currently the Assistant Manager of Product Development in Abrasive Engineering Pte Ltd. He believes a successful leader is obliged to grow others by nurturing more leaders. He has recruited many young professionals and equipped them with necessary leadership skills. The Institution of Engineering and Technology is the largest multidisciplinary professional engineering institution in the world. IET was formed in 2006 and its worldwide membership currently stands at 167,000.